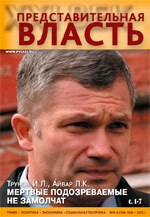 An article by Trunov I.L., Aivar L.K. «Dead suspects won't become silent» is the main topic of Issue 5,6/2011 of the magazine “Representative Power – Century 21”. Other important topics include articles by the following authors: Gurbanov R.A. - Influence of the European convention on protection of human rights and the basic freedom; Oganesyan S.S. - About the origins of legal nihilism of our people; Voronin G.P., Komarov G.A. - Main factors of degradation of human health and the health care system in the Russian Federation (Parts 4); Cherny V.V. - Globalization of civil society helps globalization of democracy; Scherbak E.N. - The higher vocational training as a basic element of development of national economic system of Russia in the conditions of globalization; Belyakov A.V. - Patient and his right to receive health care in the European union”. Several other articles also deserve mentioning: Laletina A.S. - The Draft federal Law «On major gas pipeline transportation» №99045329-2: main provisions and principal disadvantages; Lychkan L.P. - The activities of the local self-government bodies on social protection of population; Lityagin N.N. - Investment relations in social sphere, feature of their legal regulation; Veselova N.J., Savvidi S.M. - Tendencies of development of social policy at the enterprise; Ignatov S.N. - The restructuring of machine-building enterprises and the content of its main stages; Staurin G. - The instruments of state control of structural reorganization in stimulation of investment activity of machine building business; Interview with the chairman of Council of veterans of the trade-union committee of Primary trade; The memory of professor N.M. Korshunova. I.L. Trunov, Doctor of Juridical Science, Professor, Member of the Russian Academy of Natural Sciences, Vice-President of the Federal Association of Lawyers; L.K. Aivar, Doctor of Juridical Science, Professor. Abstract. 14 July 2011 held a historic ruling of the Constitutional Court of the RUSSIAN federation (no.16-P) on the case about the verification of constitutionality of the provisions of item 4 of part 1 of article 24 and paragraph 1 of the article. 254 OF THE CODE OF CRIMINAL PROCEDURE. Abstract. This paper presents the influence of the European Convention on Human Rights and the jurisprudence of the European Court of Human Rights on the European Court of Justice. Author thinks that the accession of EU to the Convention will not bring substantial changes in the relations of two law system (EU and Council of Europe). This accession also will not change the relations of the European Court of Human Rights on the European Court of Justice. Oganesyan S.S., doctor of pedagogical sciences, professor, state adviser of the Russian Federation of 1 class, a member of advisory council of Committee on affairs of public associations and religious organisations the State Duma of the Russian Federation, full member of Academy humanitarian researches. Abstract. The article attempts to identify some of the main historical causes which have predetermined a legal nihilism of our citizens. In particular, the absence of specific legislation in Christianity, therefore legal proceedings were made in accordance with the rules of the common law, which was completely contrary to the principles of Christian morality and ethics; the legal autonomy of the Russian apanage principalities; the serfdom during the strengthening of centralized Russian state, etc. Abstract. As object of legal regulation investment activity is many-sided. Essential influence on it is rendered by investment sphere. In article specificity of a legal regulation of social investments is considered, the attention that the social sphere remains sphere of responsibility the states (Russian Federation), subjects of federation and municipal unions is focused. In this connection the considerable attention is given legal regulation of the public investments which are carried out in social sphere. Laletina A.S. The Draft federal Law «On major gas pipeline transportation» №99045329-2: main provisions and principal disadvantages. Laletina A.S., Candidate of Law, Associate Professor of the Department of Civil and Labor Law at Russian State University of Trade and Economics. Abstract. In 1999 The Federal Law “On Gas Delivery in Russian Federation” was adopted. This Federal Law among other aspects also regulates the relations in gas transportation area. In parallel the draft of the Federal Law «On major gas pipeline transportation» was under development. The draft of this Federal Law, presented for the second round of review by Russian State Duma is the subject of this article. Cherny V.V., Foundation for the protection of the constitutional rights if indigenous people of Russia, vice-president. A.V. Belyakov, Candidate of Law, deputy of the RF State Duma, Member of the State Duma Committee on the Federal Affairs and Regional Policy, Member of the “Fair Russia” Faction. Abstract. Public health care in the process of the free movement of people in the European union is analyzed in the article, taking into account that member states keep the competence to regulate their own health care systems. The general order of receiving medical service when abroad is reviewed as well as the conditions to receive both planned and extraordinary services. G.P. Voronin, President of the All-Russian Quality Organization, Chairman of Committee on Quality of Products of the RF Chamber of Trade and Commerce, Doctor of Technology, Doctor of Economics, Professor; Komarov G.A., Professor of Public Health and Health Training Institute FMBA. Abstract. The article says that the system of public health - a complex ethical, legal, educational,environmental, political, organizational, managerial, economic, logistical, and specialbiomedical perceptions, decisions and actions taken at national, regional and municipal levels Providing conditions for the safe existence and development,reproduction and realization of the intellectual, physical, and labor (productive) capacity of people, protecting them from adverse effects of natural, technological and socialenvironment. In the article makes a detailed analysis of the problems in this area. Abstract: With development of the higher vocational training steady functioning of national economy, its safety as a component of national safety directly communicates. Value of the higher vocational training for economic safety and the economic sovereignty of the state in the conditions of globalisation and integration of Russia into world economic system steadily increases. It becomes motive power of domestic economy without which forward, innovative development of Russia is impossible. S. Ignatov, Postgraduate of National Institute of Business. Abstract. The article says that the current structure of the domestic engineering industry is characterized by numerous deformations, which lead to the high energy intensity and material intensity of products and contribute to the relatively low productivity of labor. According to the Institute of economic forecasting, RAS, growth of labour productivity in relation to the pre-crisis level by the end of 2010, was observed in all kinds of activities of domestic manufacturing industries except for mechanical engineering. Staurin G. The instruments of state control of structural reorganization in stimulation of investment activity of machine building business. V.U.Veselova, Candidate of Economics, Assistant Рrofessor of the Кuban State Politechnic University, Krasnodar. S.M. Savvidi - Candidate of Economics, lecturer of the Кuban State University, Krasnodar. Abstract. Enterprise social policy influences loyalty of the personnel,¬ image of the company and other indicators ¬ influencing efficiency of business and level ¬of capitalisation. It is conclusive, that its presence in the company - an axiom of market relations. The potential ¬ client, entering into organisation office, should feel, that in it there is a certain corporate ¬ spirit and culture, the normal and correct ¬ relation to the personnel. Lychkan L.P., a lecturer of the National Institute of Business. Abstract. The article says that the current system of municipal bodies of social protection of the population is formed on the principle of "development "of budget funds and is not aimed, in due measure, to the achievement of social and economic efficiency of social spending. The activities of the local self-government bodies on social protection of population should be ensured through the funding of social protection measures; revision of the organizational-legal status of institutions of social protection; introduction of modern management technologies; the system of standardization of social services; improvement of personnel and information-analytical maintenance. Interview with the chairman of Council of veterans of the trade-union committee of Primary trade-union organization of the State Duma of the Federal Assembly of the Russian Federation V. Tarasova. Tarasova V.P., chairman of Council of veterans of the committee of Primary trade-union organization of the State Duma. Abstract. In an interview with the chairman of Council of veterans of the trade-union committee of Primary trade-union organization of the State Duma of the states on the current status of the workers-veterans of the State Duma, the role of the trade union committee, the specific assistance provided to veterans and the protection of the rights of veterans.